MONDAY UPDATE: So much for the oldies on Buffalo's WWKB (1520) - after a three-year run with the format (almost to the day, actually), they're gone, as of 3 PM Monday, replaced with liberal talk. And that means two liberal talkers in Buffalo, unless Entercom's pre-emptive strike on 1520 knocks WHLD's plans out before the new station can even get out of the gate. Much more next week! *There are certainly bigger stories making headlines in PENNSYLVANIA this week - especially for football fans anywhere west of Harrisburg or thereabouts - but for fans of old-time radio history, there's a pretty significant story developing in the small town of Grove City, halfway between Pittsburgh and Erie. That's where one of the last vestiges of the early history of educational radio may now have breathed its last. WSAJ (1340) traced its history back to amateur station 8CO, which began operations in 1914. After being silenced by the war, Grove City College returned to the air in 1920 as 8YV, and in 1921, 8YV received a broadcast license as WSAJ, using a transmitter built by electrical engineering professor Dr. Herbert W. Harmon. For most of its existence, WSAJ shared time with what's now WOYL in Oil City, and even after WOYL went full-time (with a directional antenna), WSAJ remained at 100 watts, operating only two days a week from the very same wire cage antenna (rebuilt in 2002) from which it signed on in 1921. 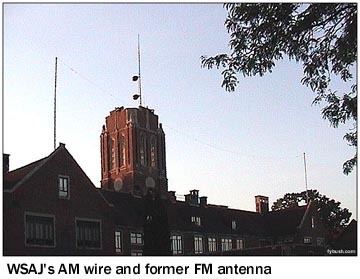 There's very good reason to believe that the antenna atop Rockwell Science Hall is the oldest AM transmitter site in the United States, predating by several years the KGFJ (KYPA) site in Los Angeles. Sadly, WSAJ's long run on the AM dial now appears to be over. The station added an FM service on 91.1 in the eighties, and the AM facility's been somewhat neglected ever since. Its 1950-vintage transmitter was out of service for a while, and the old cage antenna was damaged a few years ago. And while the antenna was fixed and a new LPB transmitter installed, WSAJ's management apparently lost interest in their historic little treasure somewhere along the way. Last week, word began circulating that there wouldn't be a renewal application filed for WSAJ(AM), and it now appears that the FCC has cancelled WSAJ's license and deleted the AM callsign. Does Grove City College know what it's on the verge of losing for good? And is it too late to do anything about it? *Elsewhere in the Keystone State, WAMO (860 Millvale-Pittsburgh) announced that it will join Radio One's new urban talk network beginning February 27, adding Radio One's 10 AM-7 PM schedule to a lineup that already includes Tom Joyner's morning show and the local Bev Smith talk show in the evening. WAMO had been carrying on the "Majic" R&B oldies format that was simulcast with the former WJJJ (107.1 Greensburg), which relaunched last week as "Sam FM" WGSM under new owner Renda. Over at KDKA (1020), the latest reshuffling of the schedule has Jim Cramer's new Westwood One financial talk show filling the last hour of what's now Bill O'Reilly's noon-2 slot. KDKA is launching a noon news hour to fill the first half of that daypart, and that means O'Reilly gets pushed back to the 10-midnight spot. KDKA still hasn't announced a permanent host for 6-10 PM, the last brick in its controversial schedule change. Our best wishes are going out to WEAE (1250) talk host Mark Madden, who suffered a heart attack last Monday. Madden drove himself to the hospital, and he's reportedly recovering well. Down in Waynesburg, WXXP (1580) returns to the WANB calls it had for many years. It continues to simulcast with WANB-FM (103.1 Waynesburg). *The FCC's all done with FM Auction 62, and that means we can tell you who the winning bidders are. In Pennsylvania, just three FM construction permits were up for auction - 98.5A Meyersdale ended without a winning bid, so it'll reappear in a future auction. 101.3A Strattanville (near Clarion) went to First Media Radio LLC (which owns WZWW Bellefonte-State College), for $408,000, while 106.1A Farmington Township goes to World Radio Link (the religious broadcaster from Idaho) for $28,000. *Western NEW YORK is getting another progressive talk station, with a familiar Buffalo name at the helm. Starting next Monday (Feb. 13), Citadel will lease WHLD (1270 Niagara Falls) to "Niagara Independent Media," a consortium that includes longtime Buffalo newsman Ray Marks. He and Alex Blair will host a 6-10 AM talk show on the station, with programming from Air America filling out the day. Alert NERW readers will recall a mention late last year of the WHLD calls appearing on - and then disappearing from - the Air America website, and now we know why. Will WHLD do better than Entercom's WROC (950 Rochester), where a mediocre signal and a near-total lack of promotion (not to mention the disappearance of local content) have led to nonexistent ratings? It can't hurt to have Ray Marks involved, certainly, and the WHLD signal (diplexed with WNED 970 at that station's five-tower site in Hamburg) catches most of the areas in Buffalo and the Falls that would likely tune in to the new programming. Speaking of WNED, the public broadcaster is joining forces with the state's other public TV outlets (WXXI Rochester, WCNY Syracuse, WSKG Binghamton, WPBS Watertown, WMHT Schenectady, WCFE Plattsburgh and WNET New York) to launch a fiber interconnection that will allow the stations to share programming statewide, including WNED's "ThinkBright" educational channel, which will be seen on DTV subchannels across the state once the interconnect is completed. The interconnect project, which will cost $1.35 million, is funded by a matching grant from the Corporation for Public Broadcasting. In Syracuse, WCNY says it will eliminate all on-air fundraising by 2007, using revenues it hopes to generate with the purchase of a local commercial production company. WCNY says it's paying $72,500 for Axxess Television Production. And while we're on a public broadcasting roll here, we note that Albany-based WAMC is applying to the FCC to completely rebuild the antenna system at its latest purchase, WRUN (1150 Utica). It wants to replace WRUN's five aging Lingo towers with four conventional guyed towers. WRUN would drop power from 5 kW day/1 kW night to 4 kW day/480 watts night, but the increased efficiency of the new array should mean the station's coverage will remain about the same. Two more upstate notes - Birach's WTOR (770 Youngstown) has applied to increase its day power from 9 kW to 13 kW, pumping even more RF across the lake towards its target audience in Toronto. *Lots of news downstate as well, including the departure of Andy Rosen as regional VP/market manager at Clear Channel/New York. Senior VP Rob Williams takes Rosen's duties for now, and there's a strong rumor that Rosen will soon be filling Barry Mayo's soon-to-be-vacated seat as head of Emmis' New York cluster. Clear Channel's WLTW (106.7 New York) has named a replacement for former PM drive jock Steven E. Roy, and it's a familiar New York voice - WPLJ's Rich Kaminski, who lost his midday shift there when Rocky Allen returned to the station last year. Kaminski had been doing weekends and swing at WPLJ. WFNY (92.3) is also picking up the Jim Cramer show, formerly heard on WOR (710) - and "Free FM" will put Cramer on live at 1, right between JV and Elvis and Penn Jillette. Cramer's WOR Radio Networks show will end this Friday, and he'll start on Westwood One and WFNY next Monday (Feb. 13). Sorry to report the passing of two New York voices: Al Lewis was best known as "Grandpa Munster," of course, but his long and varied career also included political activism and a Saturday talk show on WBAI (99.5), which had been hosted by his wife Karen in recent months as Lewis' health deteriorated. Lewis died Friday (Feb. 3); he was widely reported to have been 95, but his son says he was 82. And Michael O'Neil, whose deep tones were heard doing news on WMCA and WINS, died last week in Florida at the age of 74. O'Neil, whose resume also included a stint at Chicago's WCFL, retired from WINS in 1992. One of the state's smallest stations is about to get a little bigger. Community broadcaster WDFH (90.3 Ossining) has been granted a construction permit to jump from 12 watts/325' above average terrain to 116 watts/413', with a directional antenna. And what about FM Auction 62? One of the bigger bids nationwide was for 106.7A Windsor, east of Binghamton, which went to Equinox Broadcasting (WCDW 100.5 Susquehanna PA) for $545,000. Equinox also got 97.1A Canaseraga, for $210,000.In the Catskills, Talkline Communications (former owner of WLIR, now WRCR 1300 Spring Valley) will pay $389,000 for 102.9A Narrowsburg, while Scranton's Shamrock Communications pays $144,000 for 107.1A Livingston Manor. Pembrook Pines adds to its Southern Tier holdings with a $231,000 winning bid for 93.5A Wellsville. Randy Michaels' RadioActive LLC won 105.9A Little Valley ($108,000) and 100.7A Minerva ($81,000). Jonathan M. Becker gets 93.3A Saranac Lake ($165,000). And Live Air Communications gets 94.1A Old Forge ($101,000). *There's a pair of power increases on the way in VERMONT and adjacent parts of upstate New York, now that the FCC has granted WRGR (102.3 Tupper Lake NY) a CP to upgrade from class A to C3 and move to 102.1, and WLFE (102.3 St. Albans VT) a CP to upgrade from A to C3 and move to Grand Isle. WRGR will go from 150 watts/1448' to 1200 watts/1448', picking up better coverage towards Lake Placid. WLFE will go from 440 watts/801' at its current site near St. Albans to 20 kW/364' from a new site in Beekmantown, New York (near Plattsburgh), sending its signal across Lake Champlain to Burlington as well. FM Auction 62 brought two winning bids in Vermont: Fine Arts Communications (John Fuller, owner of WBMW and WWRX in Connecticut) gets 97.5A Bristol for $1,255,000, while Vermont Public Radio won 106.9A Brighton, in the Northeast Kingdom, for $147,000. *In NEW HAMPSHIRE, WASR (1420 Wolfeboro) flips from AC back to adult standards; it's using ABC's "Memories" service outside of morning drive, where Joe Collie continues his local show. Auction 62 brought several winning bids in northern New Hampshire: Alexxon Corp. won 93.7A Groveton ($178,000), Steven Silberberg's White Park won 99.1A Whitefield ($196,000) and Jackman Holding Company won 98.7A Stratford ($63,000). *In down east MAINE, Louis Vitali won 101.1B Machias, with a $76,000 bid. Over in western Maine, the new owners of WKTJ (99.3 Farmington) are making waves. The Central Maine Morning Sentinel reports that the station will soon move from its longtime home on Voter Hill Road (at the old WKTJ 1380 site) to a new storefront studio on lower Broadway. The Sentinel reports that owner Clearwater Communications is also about to buy Skowhegan's WCTB/WHQO/WSKW from Mountain Wireless, which has been LMA'ing the stations to him. And veteran Portland morning man Bud Sawyer, last heard on WLAM in Lewiston, is back on the air. The Maine Sunday Telegram reports he's volunteering to do the 7-10 AM shift at nonprofit WYAR (88.3 Yarmouth). *It's the end of the line for more than half a century of community radio at two eastern MASSACHUSETTS AM stations. The Asher family, which put WJDA (1300 Quincy) on the air in 1947 (the calls stand for James D. Asher) and which has owned WESX (1230 Salem) for years, is selling the stations, for $4.5 million. The buyer is Principal Broadcasting Network, with financial support from Mercury Capital Partners, and when the deal closes, Principal principal Otto Miller (who ran New York's WNWK and WKDM for Multicultural Broadcasting) will reportedly flip the stations to a religious format similar to that at WDJZ (1530 Bridgeport CT). Over in Maynard, it was another tumultuous week for WAVM (91.7). The station's fight for survival was featured in a segment on NPR's "All Things Considered" last week (including an interview with your editor) - and in the meantime, WAVM and its partner, Boston's WUMB (91.9), rejected a proposal from Living Proof that would have settled the controversy over the FCC's tentative grant to the California religious broadcaster of a construction permit in Lunenburg. *After a month of silence, WALE (990) in Greenville, RHODE ISLAND is back on the air. It's reportedly running soft Spanish AC music, for now. *And in CANADA, Chris Sisam moves up from VP/sales to general manager at Corus' Toronto stations (CFMJ 640/CFNY/Q107). *Didn't find a Tower Site Calendar 2006 under the tree/menorah/Blaw-Knox diamond tower model of your choice over the holidays? Our supply is running low, but you've still got time to place your order - don't wait!